ABT is no stranger to , but its latest project is unlike anything the aftermarket tuner has done before. What you’re looking here is a world first: a hybrid . 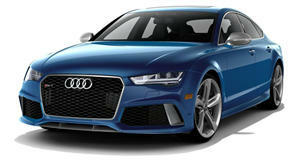 Building on the tuner’s previous take on the German wagon, ABT calls its creation the Audi RS6-E. Under the hood, ABT has boosted the 4.0-liter V8 to produce a whopping 730 hp. That would be impressive in its own right, but the tuner has also added an electric motor in the Audi’s transmission tunnel that sends an additional 288 hp to the rear wheels. This setup gives the Audi RS-E a neck-snapping output of 1,004 hp and 952 lb-ft torque, which makes it nearly twice as powerful as the standard RS6 Avant. ABT says its new hybrid will do 0-62 mph in 3.3 seconds, which is insanely fast for a family wagon. There are a few catches, however. The main drawback is that the full power isn’t always accessible. Instead, ABT has a “Magic Button” that activates the electric motor – and it can only be activated above 60 mph. The RS6-E drivetrain simply can’t handle full power below these speeds, so the impressive 0-62 mph sprint is coming from pure gasoline power alone. It can also only be used in short 10 second bursts to prevent it from overheating. To make the car stand out, ABT has added a film wrap that mimics the design of a printed circuit board and an aerodynamics package, which includes front lip and skirt add-ons, fender insets, new side skirts, and a rear spoiler. H&R suspension springs also lowers the ride height, and the car rides on 21-inch wheels. If you were hoping to buy one, we're afraid you're out of luck because the RS6-E is just a prototype. ABT wanted to preview the possible future of tuning, but hasn’t said if the hybrid RS6-E will ever go into production. Still, it's an interesting concept that shows how the aftermarket tuning scene could evolve as hybrids become more prevalent. Наш интересный интернет-сайт на тематику steroid.in.ua.